The BHA recently acquired many original World War II Buick production documents and photographs that were collected and preserved by Buick executives John W. Burnside and H.F. Hufstader. To view these documents, browse the World War II research archive by year. Simply type in one or more search terms (the words or phrase that best describe the information you want to find) into the search box and click the Search button. Please select a year to view all documents in our archive relating to that year. The Buick Heritage Alliance proudly announces that its mission and web site have been expanded to include the acquisition, preservation and digitizing of documents related to Buick's World War II production efforts. Through the recent efforts of BHA Board of Directors members David M. Landow and James V. Dingell, Jr., the BHA has acquired many original World War II Buick production documents, files and photographs that were collected and preserved by Buick executives John W. Burnside and H.F. Hufstader. The BHA is in the process of digitizing thousands of Buick wartime photographs and documents, some of which have not seen the light of day since being placed in Mr. Hufstader's files during, and immediately after, WWII. The digitizing of so many documents is a time consuming, monumental task; however, as the digitizing of the BHA's World War II Buick documents continues, its electronic research Archive will continue to be expanded to enable World War II researchers and historians to learn more about Buick's large-scale contribution to the war effort. 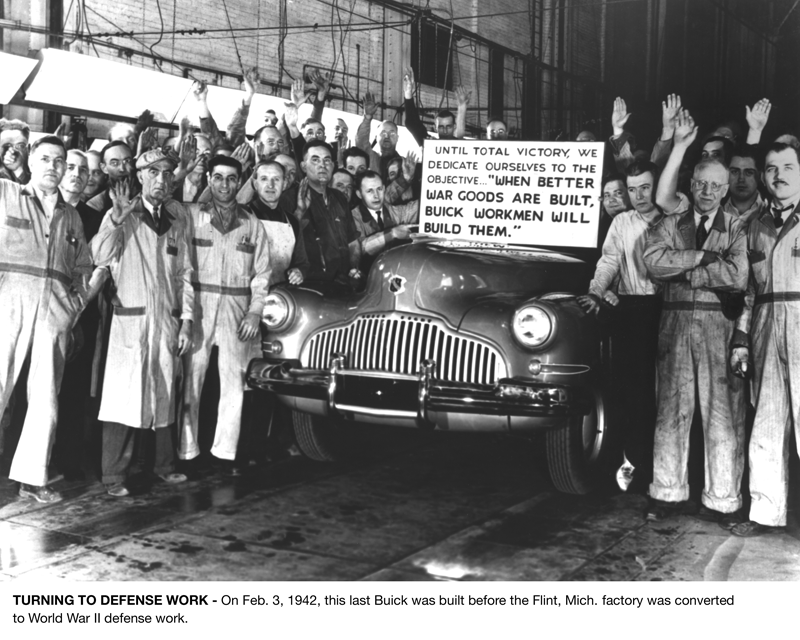 The last pre-World War II Buick built in Flint came off the assembly line on February 3, 1942, at which time, most all manufacturing plants in the United States converted to production of war goods. Buick's last pre-World War II car was a war-time "black-out" Model 41 Special. Buick was intensely proud of each and every war project for which they had responsibility, and their publicity at the time displayed that pride. Two particularly informative public relations releases that have been obtained by the BHA are, "At Work to Win" (1943) and "Buick at its Battle Stations" (1944). Researchers will find both of these wonderfully illustrated compendiums of Buick's record at war in the BHA's newly expanded electronic research Archives. Harlow Curtice, the President and General Manager of Buick Motor Division throughout World War II, who also later became the President of General Motors, said, "This is a war not only of men in uniform, but of men in work clothes, engineers in their short sleeves, executives at their desks. Every machine, every drawing board, every conference table where decisions are made concerning war goods - all these are battle stations where part of the work of forging victory goes on." 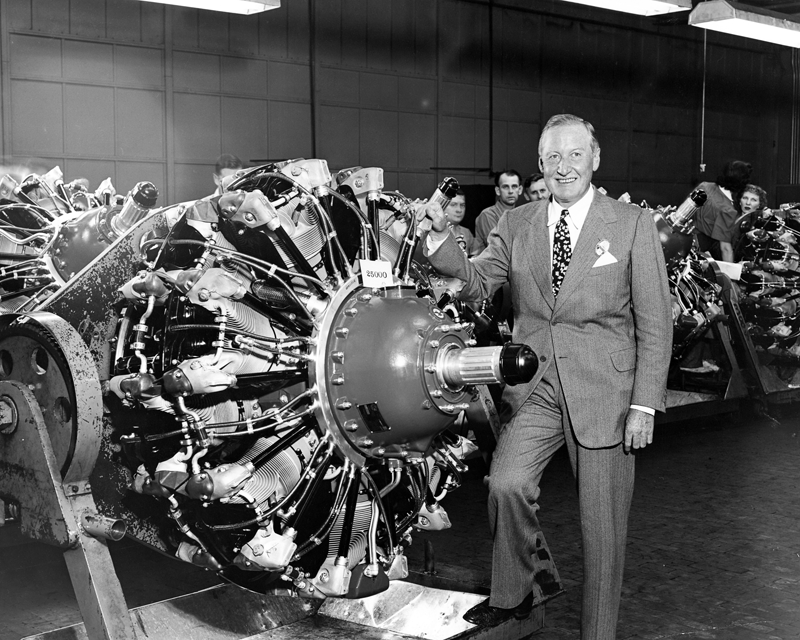 Mr. Curtice's pride in Buick's record at war is evident in the hundreds of photographs that depict his energetic visits to Factories 1 and 62, where 2,507 M-18 Hellcat Tank Destroyers were built, to Factory 11, where 74,797 Pratt & Whitney Twin Wasp radial bomber engines were manufactured, and to Building 17, where the Aviation School and M-18 Hellcat Tank maintenance school were located. On this page of our web site, the BHA will soon feature many details about the history of Buick's wartime efforts. However, so as to provide Buick enthusiasts and researchers with an idea of just how valuable Buick's wartime production was to the war effort, the following is a list of the total production of each of Buick's major war products. During World War II, "Buick at its Battle Stations" produced war materials delivered to the United States armed forces exceeding one billion dollars in value (in 1945 dollars). 74,797 Pratt & Whitney Twin Wasp radial engines for the Consolidated B-24 Liberator bomber aircraft. 2,507 M-18 Hellcat Tank Destroyers. 19,428 M-4, M-10, M-26 Tank power trains. 2,952 90MM and 4.7" Anti-Aircraft Gun Mounts. 2,424,000 75MM Steel cartridge cases. 3,120,000 Aluminum cylinder heads for Pratt & Whitney radial aircraft engines. 52,200 Aluminum engine blocks for Rolls Royce aircraft engines. 204,500 Engine blocks and cylinder heads for Army truck engines.